Golf in Oman - Al-Mouj aka "The Wave"
Opened in 2012 Al-Mouj "The Wave" is a relatively new course in the Middle East. 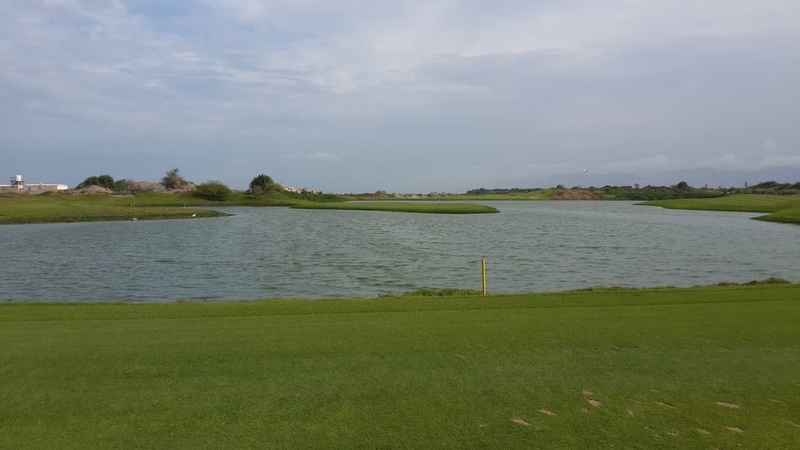 Scheduled to host its first European Tour Event next year this Greg Norman design is a beast playing 7,310 yards from the tips. This full service club has attendants to take care of your things, a decent chipping and practice area, and driving range albeit smallish in number of bays yet the range is 300+ yards. The clubhouse has everything you need such as a pro shop and dining area, however it seems a bit cramped overall. Usually the Middle Eastern design has copious amounts of open space, but this clubhouse has a tiny lobby and the building is a bit maze-like. The locker rooms are nicely done with plenty of amenities such as lemon water in a dispenser and towels for your hands. Everything looks great except it's very small. A locker key is provided upon check in. If there was a event or outing or busy day I can imagine it being very crowded, especially in the locker room. 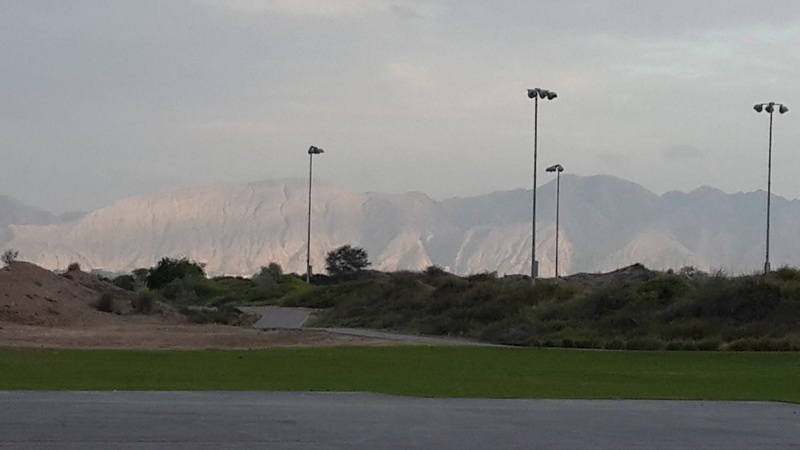 While a weekend visitor rate of 60 Oman Riyals ($156 USD) is not cheap, it compares favorably to other Middle Eastern golf courses that host European Tour Events. It's nice that the rate includes golf carts, range balls and access to the practice area. The carts have GPS, towels, and water. The GPS includes maps but omits the essential carry yardages to clear hazards and bunkers. This is a big problem, because on this type golf course with deep bunkers everywhere you need to play some position golf. 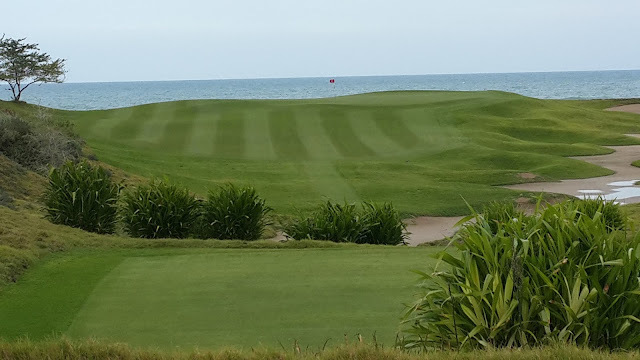 A beautiful course along the Indian Ocean features the Hajjar Mountains in the background. Certified as an 'Audubon Cooperative Sanctuary' you can appreciate the natural elements of this course. 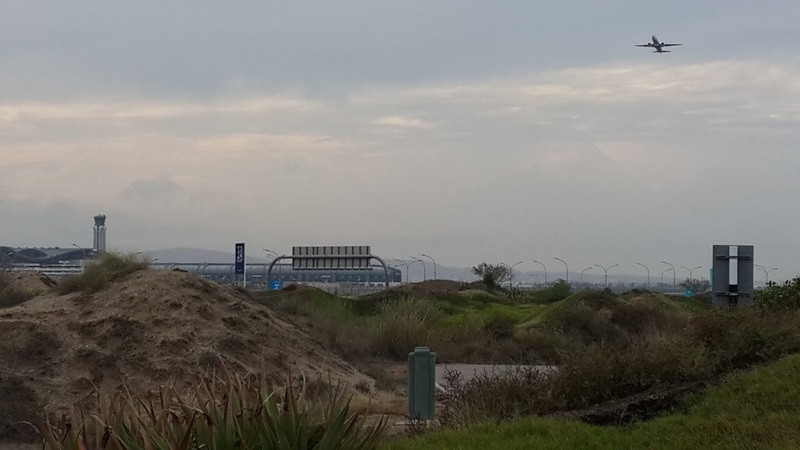 However, with the Muscat airport only kilometers away and planes flying low overhead approximately every five to ten minutes takes away from the tranquility of the course. Additionally, there seems to be very little awareness of the Audubon status as talking to members as they didn't know anything about it or what it meant. There is no indication on the score card except for a tiny logo. It should be mentioned in the local rules about avoiding restricted areas designated by red stakes with green tops. Red stakes with green tops indicate environmentally sensitive areas. The green tops were inexplicably painted red. Golf courses with protected areas usually have red hazard stakes with green tops. This is an indication that you shouldn't go in those areas, even if you can see your ball. However, the green tops on the stakes have inexplicably been painted red. This is a tough course, not for the beginner. 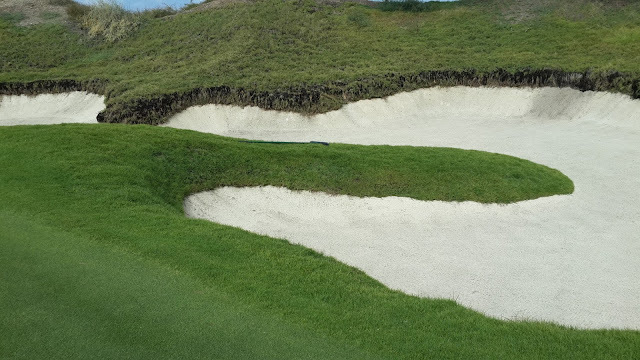 Deep bunkers, plenty of water, and high winds can ruin your score quickly. As a high single digit handicapper I was able to avoid a lot of trouble, but I imagine high handicappers will struggle on this golf course. The 5th hole is a 143 yard island green (see below) which was a lot more challenging than I anticipated. Into the wind, I rinsed a ball with a 7 iron and then managed the second shot on the green. Higher handicappers would have real trouble landing the ball on the green and holding it there. The black tees were closed, and rightfully so with a course rating of 75 and slope 140 you should probably sport a 2 index or better to play those tees. With the strong winds and links type layout, half the holes were easier despite the long yardages and the other half play very tough. In particular, hole 9 is a par 4 playing 449 yards and with a 180+ yard carry into the wind could cause problems for a lot of people. I loved the bunker design with the natural long grass on the perimeter gave it the un-manicured look. Bunker sand was consistent and nice. However, the bunkers are deep which means they are very penal and a bit difficult to step in and out of them. I happened to visit when they are transitioning changing the back nine to be the front nine and vice versa. There was very little signage on how to get to some of the holes and there was no indication on the tee boxes as to what hole you were looking at which resulted in a bit of a frustrating experience. In addition I was not warned of the switching of the back nine and front nine so it was doubly confusing! As a relatively lower handicapper found this to be a very enjoyable course, playing a lot of holes near the water and pleasant surroundings. It was a more natural golf course, with very few houses or building structures on the land. This is the type of course that is simply too hard for the beginner. 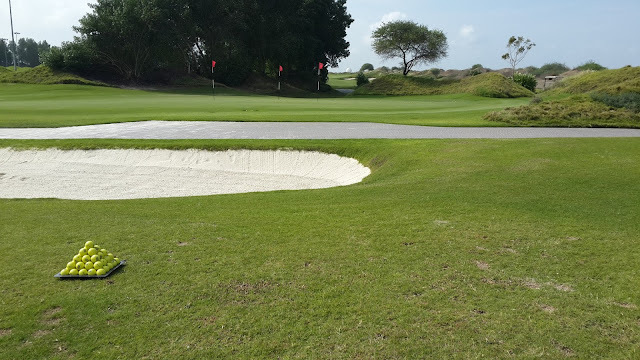 A newcomer to golf may be turned off to the sport because of the forced carries and penal bunkers. 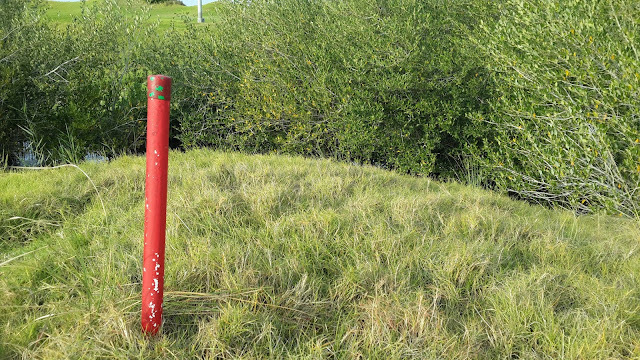 Balls that go outside of the rough are usually lost in the long grass and bushes lining the holes. The low flying airplanes and noise was a distraction and an annoyance. I wish the course promoted the Audubon more and raised awareness about this design achievement.